I’ve finally found a way to get around Zendesk’s attachment size limit, and it’s been staring me in the face for years. As an email sysadmin, I’m embarrassed I didn’t think of this sooner. We use Zendesk as the primary support system for GMass, and it’s always frustrating when a user sends us a screenshot or a video demonstrating an issue, only to find that Zendesk blocks it with the orange warning icon. In fact, lots of people are frustrated by this. We then have to ask the user to email it to us directly, which isn’t hard, but breaks the communication flow by taking the experience outside of Zendesk, which is annoying. We’ve always been on the Essentials Plan, which is only $9/month/agent, and limits attachments to 1 MB, and I’ve been hesitant to upgrade to the Team level at $29/month which allows 7 MB attachments, or the Professional Level for $49/month which allows 20 MB attachments, because the one feature I need is larger attachment handling. For that price difference, I don’t mind asking users to email us attachments directly. Keep in mind, this solution works to get around the attachment limit when YOUR USER needs to send you, the agent, a large attachment. This doesn’t work so well when you, the agent, need to send the end user a large attachment, because you don’t want to burden your user with these extra steps. As the agent, however, or the entrepreneur who’s paying Zendesk, I’m assuming you don’t mind a few simple steps to save money. Besides, if the agent needs to send a large attachment, just do it via a Dropbox link. Click the orange warning triangle. Choose to view the email source. Choose the “View Email Source” option. Click over to the last tab, Email Source. Download the source and open the file. You now have an EML file sitting on your computer. 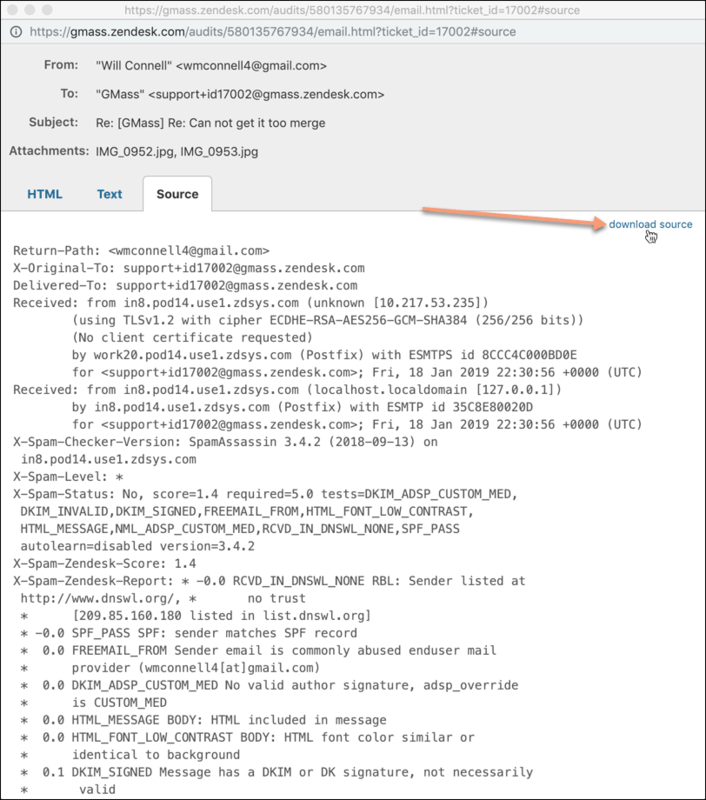 An EML file is a basic email message file, that can be opened by any modern desktop email client, on Windows or Mac. I’m a Mac user, so I have Apple Mail on my machine, even though I don’t use Apple Mail at all. Still, for this purpose, Apple Mail will do the trick. 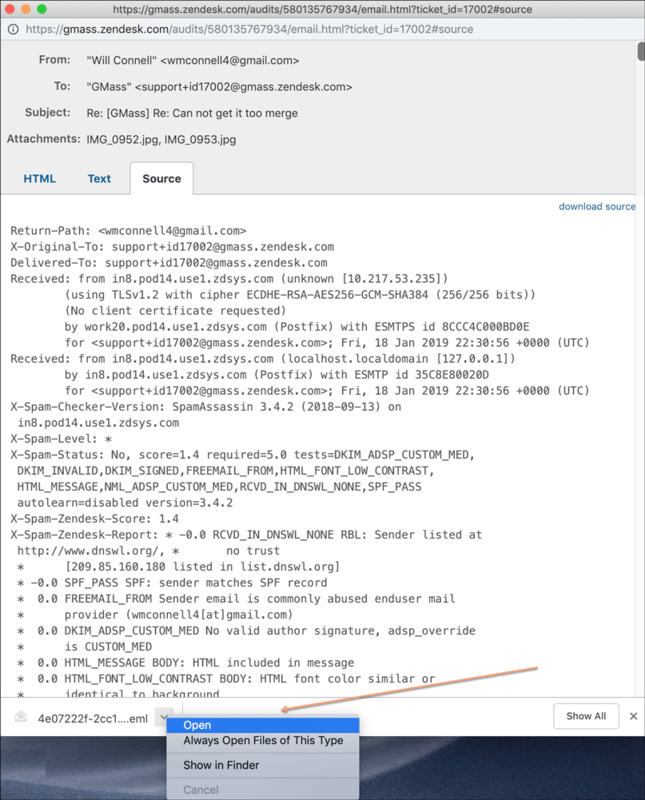 It opens the EML file and reveals the attachments that Zendesk had blocked. Enjoy your huge file that Zendesk blocked. Except that Zendesk didn’t REALLY block it. This does require a few steps, but I see it as a far better solution than asking my user to re-send the attachment by email, which hits me with a tinge of embarrassment each time. So just how big can you go? It all depends on the email system; it’s no longer a Zendesk limitation. 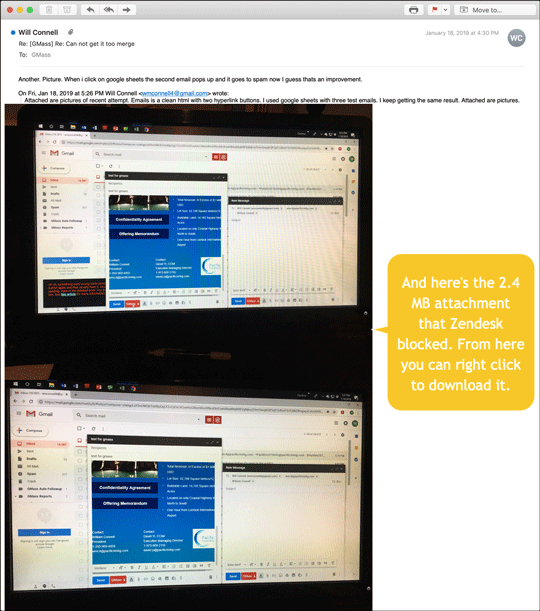 You can only use this trick if the message was sent to Zendesk via email. If you, the agent, or your end user are using the Zendesk interface directly to communicate, you’ll be stopped from attaching files larger than what your plan allows. That’s actually a reason to NOT use the Zendesk interface and use email instead. We’re power-Gmail users over here at GMass, so we’re glued to the Gmail web interface all day long. However, if you the agent use email to respond to a ticket and you attach a large file, then the end user receives that message via email, the attachment will be removed, and no warning will be given to the user that there was an attachment stripped to begin with. The warning is only present in the Zendesk interface. If you want to save money on your Zendesk plan, you don’t need to upgrade your plan just to be able to receive large attachments from your users. Use my trick. If you need to send large attachments to your users, do it via a Dropbox link. If you have non-English speaking support agents providing support to English-speaking customers, then let me tell you about my other service, Wordzen, that could benefit you. If you use Gmail as your Zendesk interface, meaning your agents respond to tickets via Gmail rather than through Zendesk directly, Wordzen can make sure your responses are in perfect English. Wordzen is a plugin for Gmail that allows my team of English experts to proofread an email. It also will take an agent’s voice instructions and write the perfect email for you.